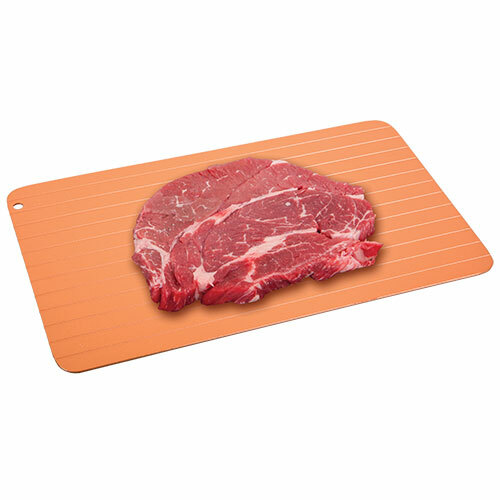 Revolutionary copper defrosting tray takes foods from frozen to the grill in just minutes! Now you can defrost foods quickly and easily without batteries, electricity or a microwave. Just place your frozen foods on this ingenious tray and watch as they "magically" begin to defrost right before your eyes. In just minutes, foods are ready to cook - no need to change plans because you forgot to take dinner out of the freezer! And it's crafted with copper so it's sanitary and won't allow bacteria to build up. It's PFOA/PFTE free and easy to store too!